Spring and fall are my favorite seasons – I love the transitional weather and the colors that come with them. But in terms of food, summer is by far the best. After the typically heavy foods of winter, the lighter dishes filled with fresh produce associated with summer are such a relief. With such an abundance of summer fruits, vegetables and herbs, I try to incorporate as many fresh ingredients as possible into what I make. Bulgur wheat, most commonly used in tabbouleh, is a healthy and versatile grain that goes great with one of my absolute favorite fruits – nectarines. Combined, this bulgur wheat and nectarine salad filled with fresh herbs is an easy, healthy and seasonal dish I love to make all summer long. Great with grilled chicken, fish, or really just about anything, this salad is a yummy side dish or can be eaten out of a bowl all by itself! Sarah McAnaw just recently returned from a year abroad in Italy and Israel. A big proponent of sustainable living and lover of everything and anything involving fresh, seasonal produce, she’s excited to be back just in time to enjoy the traditional summer fare with her family before starting her (yikes!) senior year at American University. If you don’t have white balsamic vinegar, regular balsamic vinegar works just fine. Regular balsamic vinegar will add the same taste, it will just make the salad a darker color overall. Combine the bulgur and boiling water in a medium-large bowl, cover tightly with a lid or saran wrap and let sit for an hour or until all the water has been absorbed. 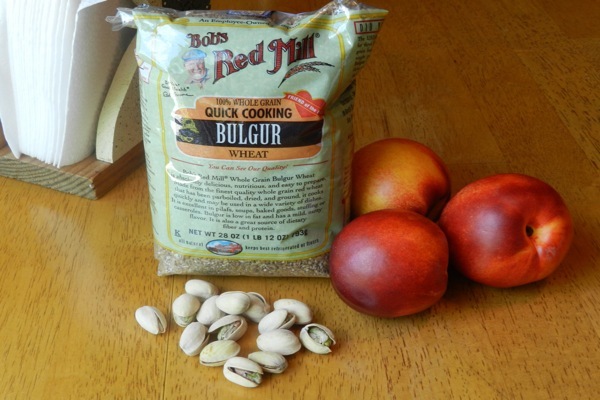 When the bulgur is ready, add the nectarines, herbs, olive oil, vinegar and salt and pepper; toss until well combined. 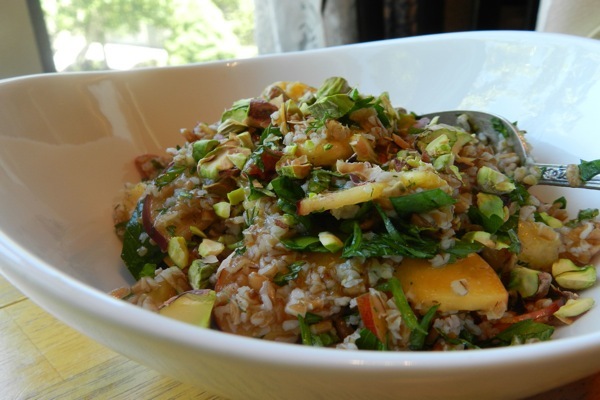 Sprinkle the chopped pistachios on top, serve, and enjoy!